The last thirty five or so years I have been using pack baskets more than a frame pack. As my trips have gotten shorter in distance it seems better to use the pack basket. I have three of them. One is a retired antique. It has no metal and even the straps are woven reeds. There is a wooden bottom. We don't know how old it is, or where it came from, but likely turn of the 20th century. The two that I use are made from woven strips of maple. The strap system on each of mine is nylon webbing. It is long lasting and sturdy. The light brown was stained a cedar colored wood stain to let it blend in a bit better when bow hunting and also to cover up some assorted damage that occured over thirty years of use. The unstained one is about five years old but hasn't been used a lot. Spends a lot of time filled with kindling and sitting next to the stack of newspapers we start the wood stove with. The tan one gets used a lot. I use it when deer or turkey hunting, canoeing, fishing, or just snowshoeing or walking along. They are really great to carry fragile items and things too tall for a regular pack. For lunch a small loaf of french bread and a sack of vegetables and a can of spam fits right in with lots of room to spare. Good place for cameras and binoculars too. If you are out collecting something like chaga, punk wood, wild berries, etal they work really well. My weights don't exceed about thirty pounds and a usually half of that on a short day trip so these packs are more than adequate for what I do. I used pack baskets when I was about thirteen and my cousin was teaching me how to trap muskrats. You could carry all your traps and gear in the pack basket a lot easier than a soft pack. Later I went to a frame pack when I did a lot of backpacking on longer trips. About thirty five years back I started using the baskets again when I did a lot of winter snowshoeing and cross country skiing. They are kind of nostalgic too and that is never a bad thing on a camping trip. The tan one is 18" high, 12 1/2" wide, and 9 3/4" front to back. The light wood model is 20" high, 14" wide, and 11" front to back. High quality baskets can run from $100 to $250 at some places. There are lots of them available on the internet sites and most have some detail about the materials and process to make them. I like the classic shape of the old one best. L.L. Bean used to sell pack baskets in three different sizes that were measured in pecks & bushels, as I recall. In days of yore, the harness was purchased separately, fit all three sizes and was constructed solely of riveted & sewn leather. I always salivated over them, but never pulled the trigger.....if I would have gone through with the plan to buy an 18 foot, wood/canvas Peterborough-style canoe instead of the fiberglass 18 foot Mad River Tripper, I would have had to buy a couple purely due to aesthetics! nice packs Stan. I have long wanted a pack basket and that light colored one looks like one I have been eyeing for a over a year at Pack Baskets of Maine. Is that where you got it? If so I'd be curious your thoughts on the quality since you've had a few. I know you said it hasn't been used much other than holding kindling but I'd still like to know if it would be a good choice. OE that 20" light colored basket is made by New England Basket Co. They are located in Maine. I got it at a show here in South Dakota about five years ago. I am aware of the Pack Basket of Maine Co., but have not seen their baskets. I would imagine that they are of good quality as well as they have been around a long time. Their 20" basket is around $100 I think and most of the Maine companies are in that price range unless they are making those higher end reed baskets with the woven in designs. There is a company named Loring that also makes an interesting basket from non traditional synthetic materials. They are expensive, about 20% more than the baskets made from wood strips but will probably last forever. Those are pretty dangled cool pack baskets, Stan......if you tap on the 'select options' button further on down that page you get a LOT of good information and a bunch more good views. Yes, I made the link go to the cheapest one and they got options. 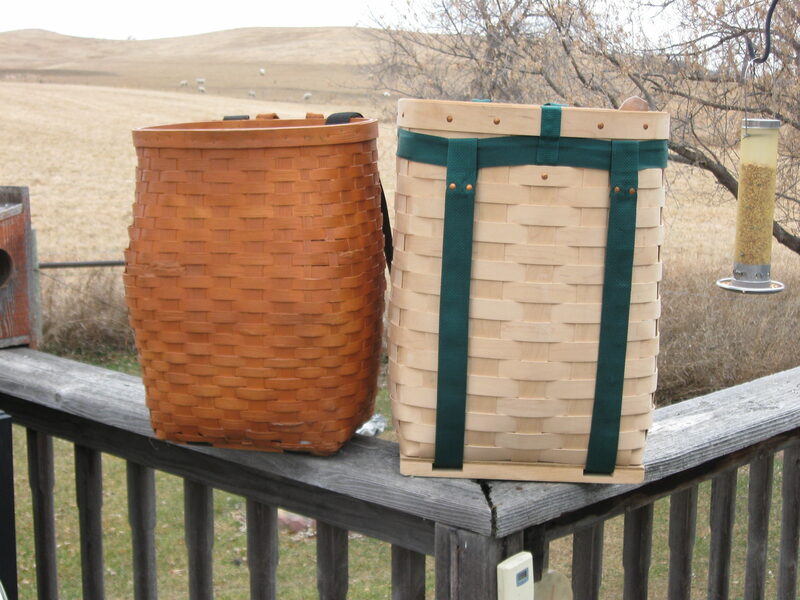 The things I do not like about the Loring baskets is simply I prefer traditional materials in these and their base model 24" model weighs 9 pounds. I assume that is empty. My pack baskets weigh 2 3/4 pounds for the older one stained cedar and 4 pounds for the larger one. The larger one has wider woven strips and a heavier bottom panel. If I were traveling by dog sled or running a trap line the extra weight would not bother me. The synthetic material will last a lot longer and perform better in wet conditions I suppose but these wood strip baskets have been around for a long time in the northern forests. 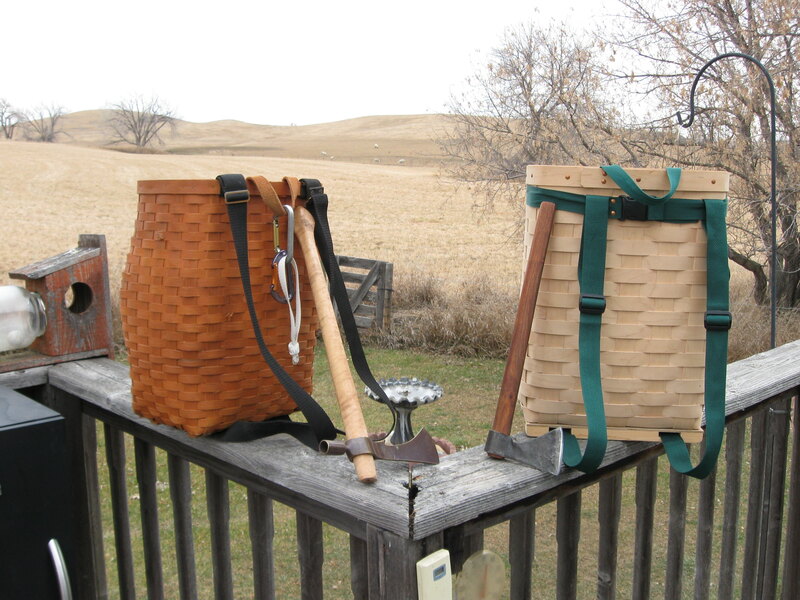 I was visiting the Frost River web site yesterday looking up their Seven Bridges day pack and noticed that they had some pretty neat pack baskets made in the traditional style, I was also surprised at their prices which I expected would be in the hundreds of dollars, but they started at under $70.00 which is pretty reasonable considering Frost Rivers quality. That is a great price Moe. I don't see many of them out west for sale and have not been on Frost Rivers site for quite awhile. Thanks for posting that.